Store notions under table and spin out with ease using the convenient acrylic spinner tray that attaches to the table leg. This includes a magnetic corner to corral pins and needles. Store notions under your Sew Steady Table and spin out with ease using our new acrylic spinner tray. Designed to attach to any Sew Steady Table leg. Includes a magnetic corner to corral pins and needles. 6" x 8" size fits in the new grey Travel Bag pocket. 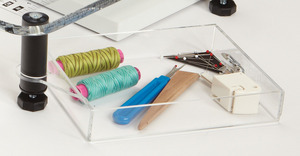 Excellent for small work spaces to keep sewing tools visible and easy to access.